Thank you for participating in America Saves Week 2019 (February 25th – March 2nd)! Ohio Saves wants to share some information about local incentives, daily savings themes, and sample content to be used during the week! Be sure to follow Lucas County Extension Facebook page for daily reminders. Any adult from Ohio who signs the Ohio Saves pledge during America Saves Week (February 25 - March 2, 2019) will be entered to win one of eight $100 giveaways! These funds would be a great way to jumpstart an emergency savings, add to retirement savings, or more! • Sign the Ohio Saves Pledge online during America Saves Week! • Text to save during America Saves Week! Who can win: Anyone in Ohio can enter to win as long as they either sign the Ohio Saves Pledge or text to save with Ohio Saves. If you take the pledge at ohiosaves.org, you must enter a valid email address in order to win. 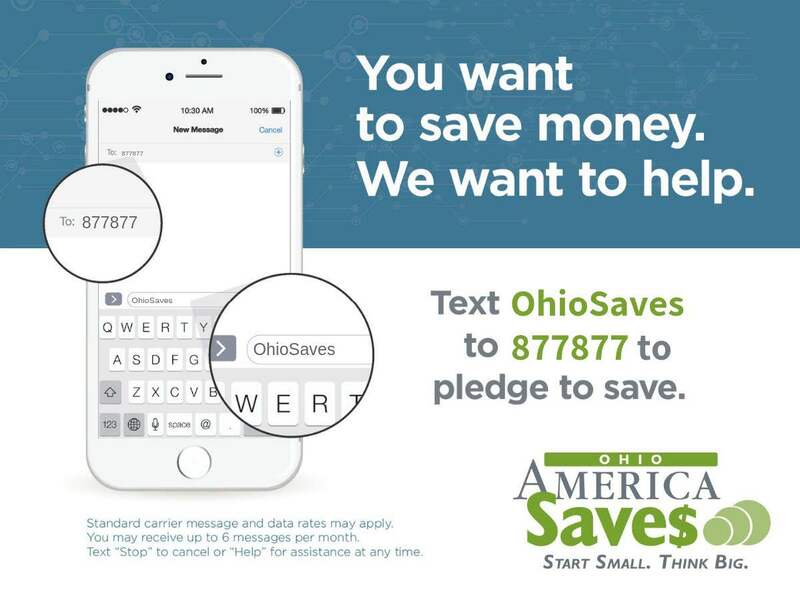 When to enter: Ohioans can take the Ohio Saves pledge at any time during America Saves Week February 25th – March 2nd!